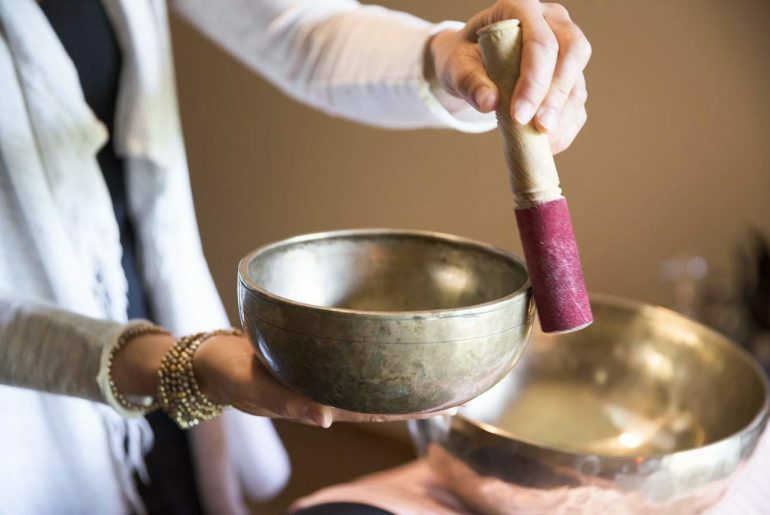 It’s somewhat ironic that at the tap of a download, your phone—a stress-inducing device that’s constantly flooding you with emails, phone calls, and texts—can transform into a source of tranquility. 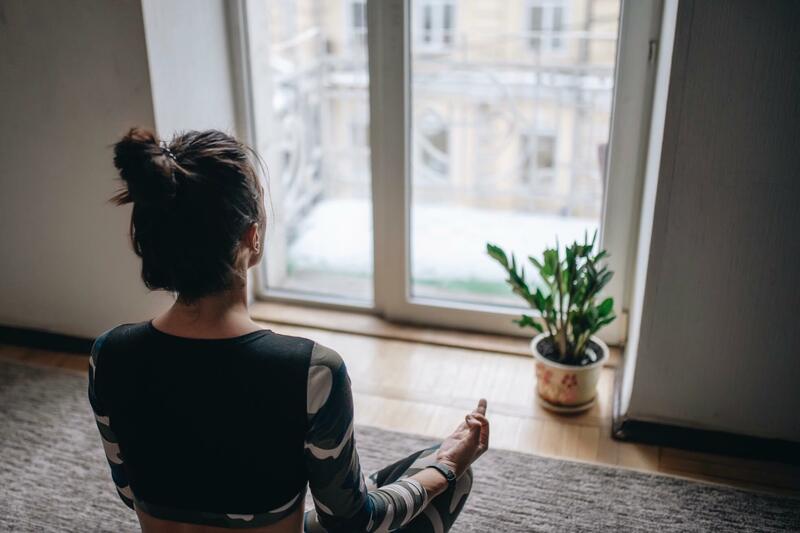 I’m talking about Meditation apps, which can help make mindfulness easier for the average Joe on the go. Two of the most popular such apps are Calm and Headspace. Both have millions of users and five-star ratings on the Apple app store. But is one app better than the other? And more importantly, which app is better for you? Each app has its own strengths and weakness. But by comparing their key features, you can get a sense of what each app has to offer, and which will be a better fit for your needs. 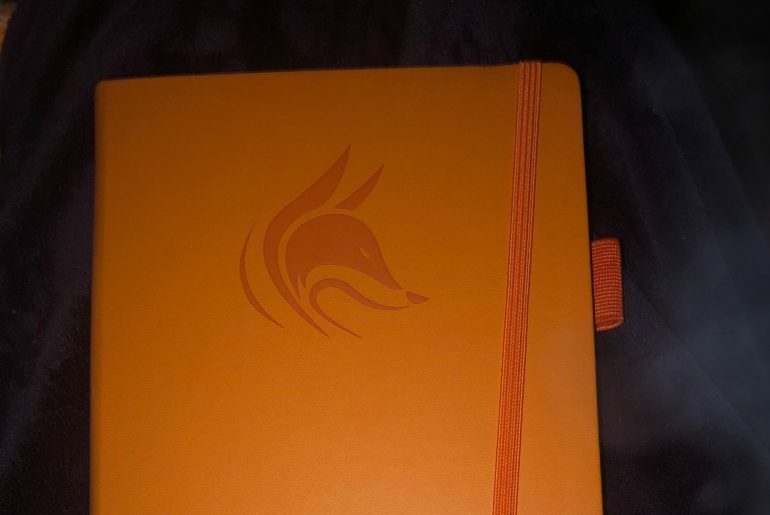 Both apps have a limited free version that gives you a taste of the content. 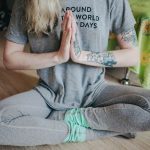 Calm gives you 7 days of full access before charging the monthly fee, while Headspace gives you the first 10 sessions from their “Basics” Course. In order to use either app for the long term, you need a subscription. At $95.88 per year, Headspace’s annual subscription is considerably more expensive than Calm’s $59.99 yearly fee. I can’t imagine that many people can justify getting the family plan. Even if you have six people in your family, do they all want to meditate? For most people, Calm is going to be the more affordable option. Both apps are very polished with appealing styles. Headspace has a mellow color scheme and features a population of quirky cartoon people who look a little like sock puppets. These cartoons are all throughout the app, including a library of educational cartoons that help explain various meditation techniques and concepts. 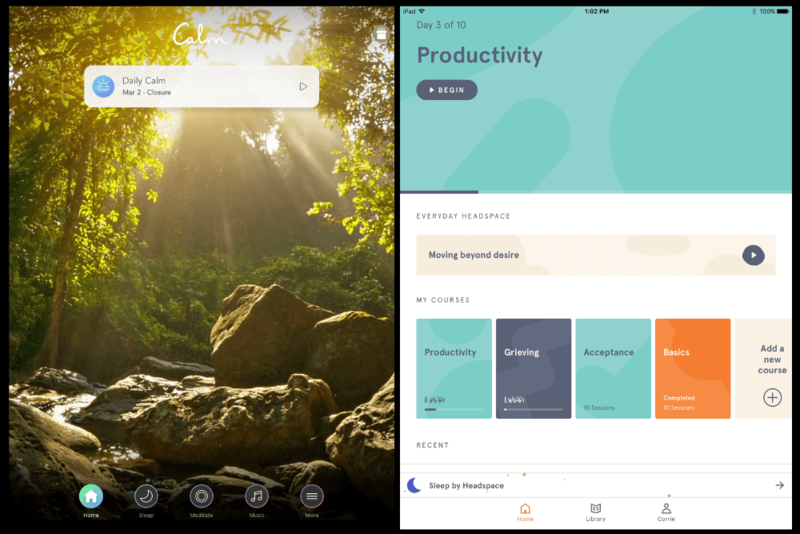 The Calm app has a modern, minimalist layout that features a nature backdrop complete with relaxing sounds. You can switch between an assortment of nature scenes and there’s even a setting to play nature sounds outside of the app. Calm’s Homescreen on the left, and Headspace’s Homescreen on the Right. I found Calm’s layout a little easier to navigate than Headspace. Although Headspace categorizes by area of focus, what you find in each menu may vary. 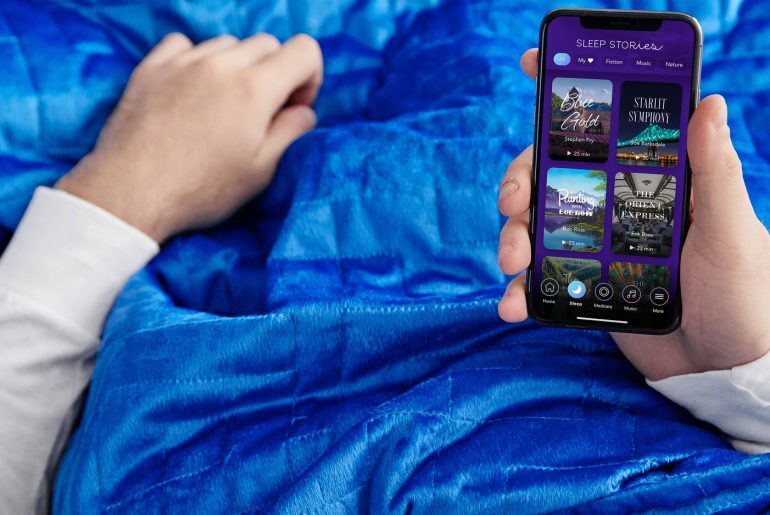 For example, if I was looking for Wind Down meditations, I would have to go to the Sleep section and then keep scrolling past the Sleepcasts and Sleep Sounds to find them. It made finding what I was looking for a little difficult at times. 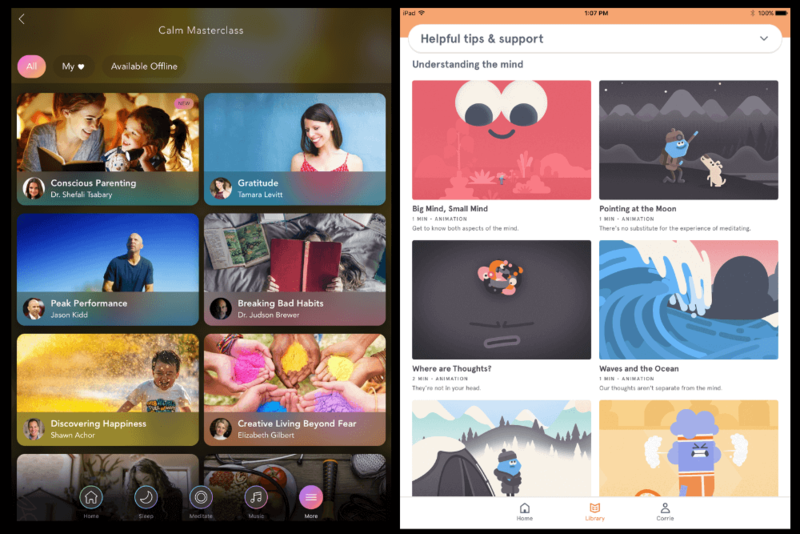 Each app features a meditation guide: Headspace’s guide is Andy Puddicombe, and Calm’s is Tamara Levitt. Puddicombe is a British meditation expert, author, and former Buddhist monk. Levitt is similarly a meditation specialist and author of two children’s books about mindfulness. Calm has a more modern take on meditation and reminds me of the kind of meditations you might experience at your local yoga studio. Levitt spends a considerable amount of time talking before the meditations. While some people might like this, I found it made me a little antsy as I just wanted to get on with the session. Although Levitt both writes and narrates the meditations, the app gives you the option to switch to a male narrator named John Armstrong. Headspace’s Puddicombe takes a more traditional approach to meditation, as you might expect from a guy who spent years training to be a Buddhist Monk. He’s a succinct guide and gets right into the meditation of each session without much preamble. Headspace is more focused on the technical aspects of meditation and Puddicombe excels at using analogies to explain the various concepts. Overall, I feel that Headspace provides a slightly better meditation experience for that reason. Calm’s session lengths and are at least ten minutes long. As a beginner, I would have like to see a selection of shorter meditations. Calm’s session lengths aren’t adjustable but Headspace’s are. Headspace has a comprehensive meditation library that addresses seemingly every topic under the sun. 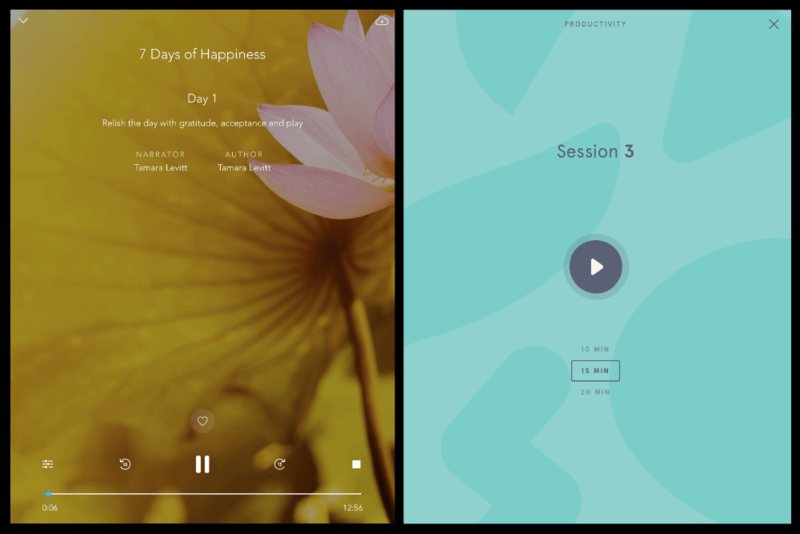 The meditation libraries from both apps. All in all, Headspace seems to have a larger selection of guided meditations than Calm. Both apps feature a Sleep section with guided meditations and soundscapes to fall asleep to. 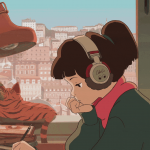 Headspace’s Soundscapes feature a variety of environments with relaxing natural sounds, while a voice describes the scene. Each soundscape has a slider bar that adjusts the volume of the voice. You can turn it all the way down if you just want to listen to the nature sounds. 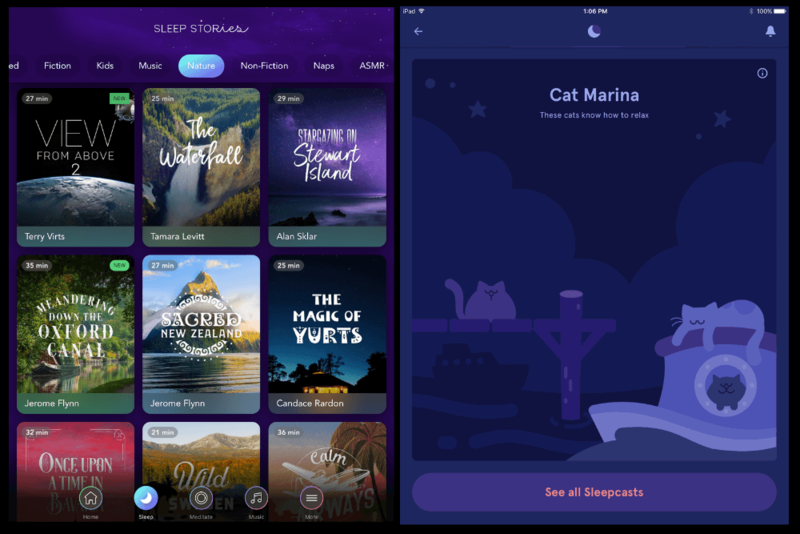 Calm’s sleep section is called “Sleep Stories” with similar nature scene selections. But Calm also includes bedtime stories and even a few ASMR sessions. Although I like Headspace’s Sleepscapes, Calm’s Sleep Stories has more variety and are a bit more fun to fall asleep to. Headspace doesn’t have its own section for Music but has a “Sleep Sounds” category with a small library of ambient, atmospheric music to fall asleep to. I find the choices are a bit limited, especially compared to Calm. Calm also has ambient music for sleep, but it’s just one part of their larger Music section. 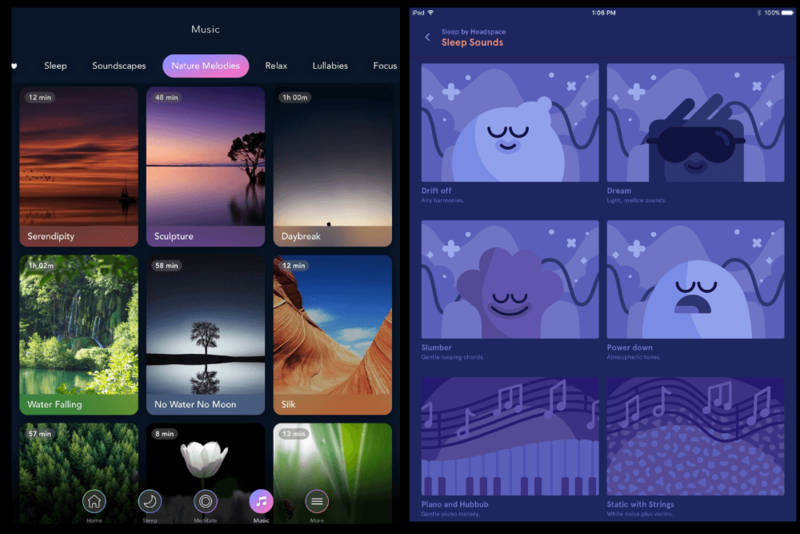 The app also has music specifically for relaxation or focus, along with several other categories including soundscapes, nature melodies, and lullabies. 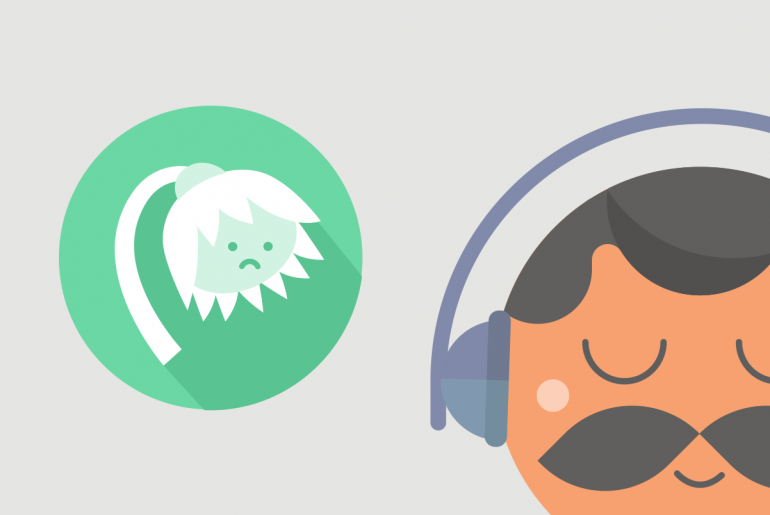 Calm has an extensive music collection while Headspace has a few “Sleep Sounds” with music meant for sleep. Some tracks are better than others, but you’re more likely to find music you enjoy listening to on the Calm app. 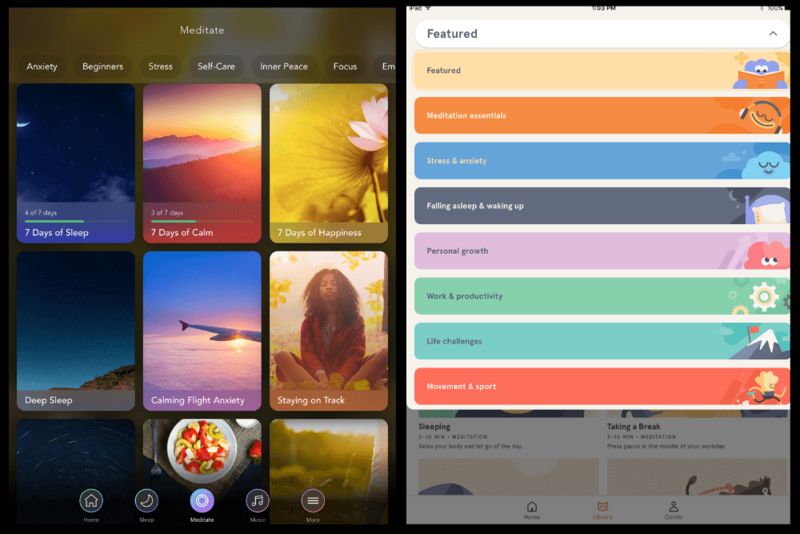 Both apps have a daily meditation and are regularly adding new content to the apps. And although both have a meditation section for kids, Headspace also has a section specifically for students. As mentioned earlier, Headspace also has a wide library of short cartoon videos that cover various aspects of meditation and it’s techniques. Other than that, the Calm app has more bells and whistles. One of the app’s best features is the “Calm Masterclass” section that contains self-help lessons in podcast format. Calm has a wider variety of features whereas Headspace solely focuses on meditation. Calm also includes a “Breathe Bubble” that you can breathe along with. 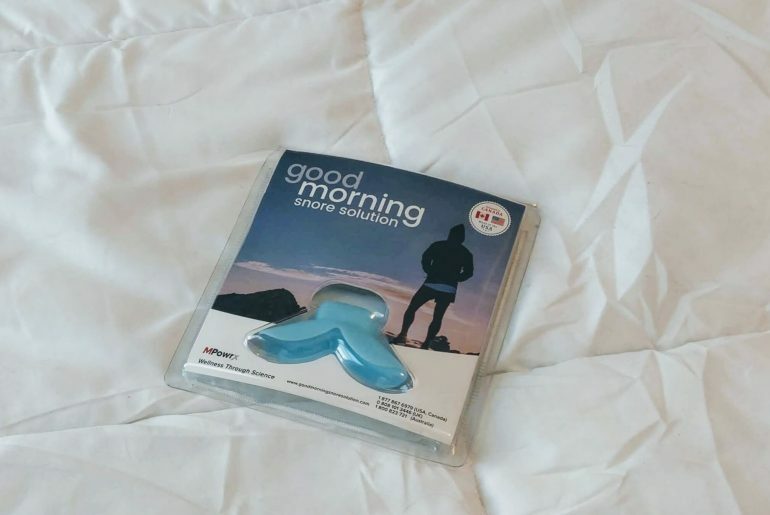 It’s useful for winding down or night, or for moments of high anxiety when you need to focus on slowing your breath. 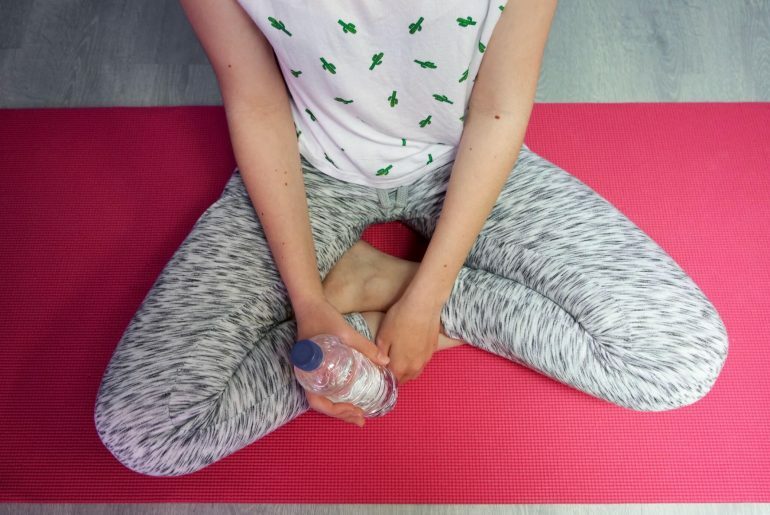 There are also short, yoga-like exercise sequences that can be found in the “Calm Body” section of the app. In short, Headspace focuses solely on meditation, while Calm also offers other outlets for relaxation and mindfulness. Headspace and Calm are both polished apps that deliver on their claim, and the right app for you comes down to personal preference. If you’re serious about cultivating a deep meditation practice, you might appreciate Puddicombe’s effective approach to explaining techniques, the wide selection of meditation courses, and the adjustable session lengths. But overall, I feel that Calm offers more value at less cost. It is not just a meditation app but a diverse resource for bringing mindfulness and peace into your day. Corrie Alexander is a blogger and logistics nerd from Toronto, Ontario. Her climb up the corporate ladder cultivated her interest in the topic of career development and personal growth - passions that are rivalled only by her love of exercise and strong coffee. Visit her website, thefitcareerist.com.